I participated in a campaign on behalf of Mom Central Consulting (#MC) for Reebok. I received a product sample to facilitate my review and a promotional item as a thank you for participating. You may have seen all the hype about Reebok's new Skyscape shoes. They are said to be so comfortable that you'll forget wearing them. They come in several colors that can complete nearly any outfit, and they are a good everyday shoe. Skyscape features 360 degrees of foam comfort and they are super light. I went online to Kohls.com and ordered myself my usual size, 9.5, in Gray. My order came quickly, and I was very excited to try these out. 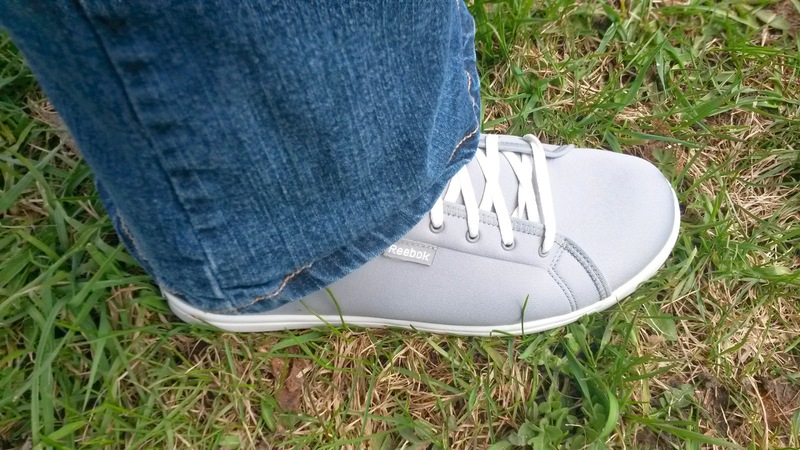 I have to admit, I am definitely more of a flip-flop style shoe girl, but I am required to wear actual shoes at work, so I had really high hopes for the Reebok Skyscape shoes. The first thing I noticed is that they were, indeed, very light. Only 5 ounces. I like light... I am on my feet or driving all day long, and a heavy shoe (or boot... like I had all winter long) makes for very tired feet and legs. The upper material is... odd? It'd definitely different. I would highly recommend you go to the store and check it out. It's stretchy and really hugs your feet. I had to loosen the laces since I felt these shoes were just too narrow. Once I loosened them up a bit, it wasn't as bad, but I still think they are awfully narrow- especially in the toe. I would love to see a wide size available for these! The sole of the shoe is super fun. I love the design and I really think it helps your foot flex how your foot is supposed to flex while walking. The support of the insole really disappointed me. The Skyscape shoes feature Skyspring technology, a unique design architecture designed to help support the foot and provide all day comfort. While the insole is soft, there seems to be very little (if any) arch support. I have a fairly high arch, so this is a huge deal for me. I was really hoping that after wearing these for a while that the sole would form to my foot, but it hasn't as of yet. However, I have noticed that my feet have not ached as much at the end of the day as they do when I wear other shoes that I own. I did notice that the shoes made my feet very hot. I am not sure if it's because I choose to wear them without socks, or if it's the material they are made with. I can't wear these shoes with socks because they feel too tight for me. A huge plus for these shoes is that you can wear them without socks because they are machine washable. This is my favorite thing about these shoes... I get muddy, and sweaty, and... well, my feet just go through a lot every day while delivering the mail, and a washable shoe is amazing. I have not yet tried to wash these shoes, but knowing I can when I need to is great. The style of the shoe is cute and fun, it's sporty, but not so sporty that you can't wear it with casual-dress items. These shoes don't look out of place with some khaki shorts and a nice blouse, or with your jeans and a tee. The Skyscape shoes would definitely look great with your workout clothes while running errands before your trip to the gym. Overall, I would highly recommend going to the store to try these shoes on. I think they will be amazing for most women, but if you have a wide foot, or need extra arch support, you will likely do better to go to the store and see if they work for you.